Last week of this month would be great, though I still don't have my D. We could get Dan and Dusty to show up maybe, and there's a few other guys as well. 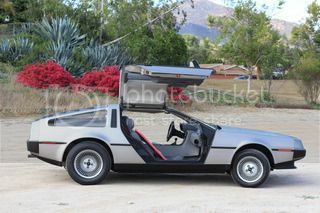 Im heading over to DMCCA on February the 12th to pick up my Delorean all the way from Norway. I will stay in LA for about to weeks and drive the car, would be cool to meet up with some other Delorean owners while Im there! Based in San Diego i picked mine back up from there. I know another local sd owner dusty is here i need to get a local meetup going, ben REALLY wanting too. Gratz on the purchase! Handful of us are meeting this weekend in Marina Del Rey... but always up for another get together. Where are you staying? If you're in Glendale, then you should at the very least take your DeLorean to Bob's Big Boy in Burbank friday afternoon/evening for their weekly cruise-in... regardless of whether or not we can get some other people together for a meetup. It's a great chance to see a bunch of cool cars, and you will be a big hit with yours. I get my D TODAY!!! So, maybe in the next few weeks we can have a San Diego get together at a Sonic. Eventually we can do one at my house out in Jamul (backside of Chula Vista) for BBQ. Thanks for the heads up! I've been to the Big Boys in toluca lake a few times, I had no idea they had a cars and coffee sorta friday afternoon thing, but I will definitely check that out both fridays while Im there! Also, I wouldn't mind a road trip to San Diego for a get together!